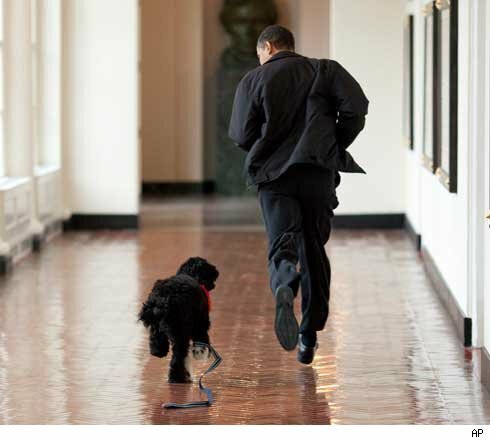 We've already told you the Obama dog is a used pooch -- with a past! Here's the lowdown. Bo, the Portuguese Water Dog whose original name was Charlie, was sold by a Texas breeder on December 8, 2008. The family that bought the dog paid $1,600. But there was a problem. The family already owned a 6-year-old female Portuguese Water Dog, and when little Charlie came to the home he got off on the wrong paw by trying to nurse on the big dog. Things went downhill from there. Right around St. Paddy's day, the family made the decision to return the pooch. The breeder, who had advance warning Charlie was about to become an orphan, had already been speaking with Senator Ted Kennedy and his wife, and made a deal to re-home the pup to the Kennedys, who paid the breeder $1,600. BTW, the breeder returned the original $1,600. The Kennedys bought Charlie with the intention of giving it to the Obamas. Charlie went from the home he had been living in to a dog trainer in Virginia, where he's been learning the tricks of the trade for almost a month. Prez Barack Obama -- That Damn TMZ!